“Clean Eating” – What Does It Really Mean? – Happy. Healthy. Holistic! “Clean Eating” – What Does It Really Mean? Milk isn’t processed, if it’s raw and unpasturized, but most people claim this isn’t a part of “clean eating”. What about wheat and gluten? I see people label recipes “clean eating” just because their 3-tier cake is gluten free. How about beans, corn, or rice? Paleo people seem to think that is a really bad idea, but all other people deem these “clean” foods. That bowl of oats? Yes or No? What if your meat is loaded with hormones and antibiotics? Is that still “clean”? If your eggs come from a chicken that has been trapped in a cage, never seen sunlight, and doesn’t even have the strength to stand up on it’s own – is that still considered “clean”? Pastured organic bacon is “clean”, right? What about eating one pound of bacon in a day. Still “clean”? Almonds are good for us! What about half jar of almond butter in one sitting? 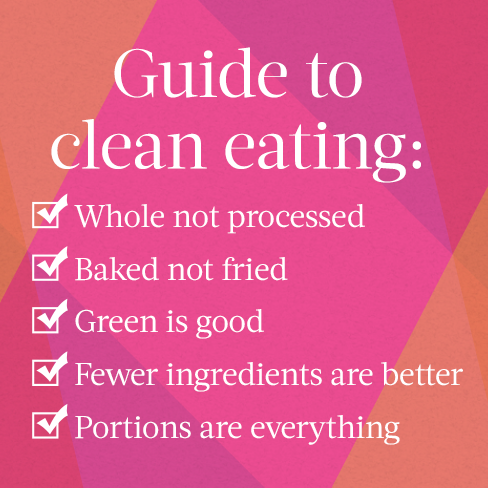 Is that “clean” eating? That salmon – is it wild caught? Ahhhh! Nobody can agree, yet everybody is obsessed with “clean eating”. Let’s not obsess about it and get all worked up, it’s food after all! It’s meant to be enjoyed! Do your best to clean up your eating habits one step at a time, and stick to it. Small changes can bring big results. Next Next post: Why are Coffee & Tea Amazing For You?